Thank you for shopping at Sympathyplaques.com. By placing an order on our Web site, you signify your acceptance of the Terms of Sale set forth herein. Please take a moment to read through our terms thoroughly. These terms may be updated at any time; please check back occasionally for updates. Materials appearing on Sympathyplaques.com are copyrighted property and are sold in accordance with licensing agreements. All rights are reserved by the copyright holders. You may use the content of Sympathyplaques.com for no other purpose than shopping on this site, placing an order on this site, or for conducting other tasks associated with conducting business on this site with Sympathyplaques.com. Unauthorized use of the materials on Sympathyplaques.com may violate copyright, trademark, and other applicable laws and could result in criminal or civil penalties. Sympathyplaques.com makes no representations or warranties, either express or implied, of any kind with respect to products sold on this site. Sympathyplaques.com expressly disclaims all warranties, express or implied, of any kind with respect to products sold on this site, including but not limited to, merchantability and fitness for a particular purpose. You agree that the sole and exclusive maximum liability to Sympathyplaques.com arising from any product sold on this Web site shall be the price of the product ordered. In no event shall Sympathyplaques.com, its officers, employees, or other representatives be liable for special, indirect, consequential, or punitive damages related to products sold. Sympathyplaques.com and the materials therein are provided "as is". Sympathyplaques.com makes no representations or warranties, either express or implied, of any kind with respect to Sympathyplaques.com, its operations, content, information, or materials. Sympathyplaques.com expressly disclaims all warranties, express or implied, of any kind with respect to the site or its use, including but not limited to merchantability and fitness for a particular purpose. You agree that Sympathyplaques.com, its officers, employees, or other representatives shall not be liable for damages arising from the operation, content, or use of Sympathyplaques.com. You agree that this limitation of liability is comprehensive and applies to all damages of any kind, including without limitation direct, indirect, compensatory, special, incidental, punitive, and consequential damages. 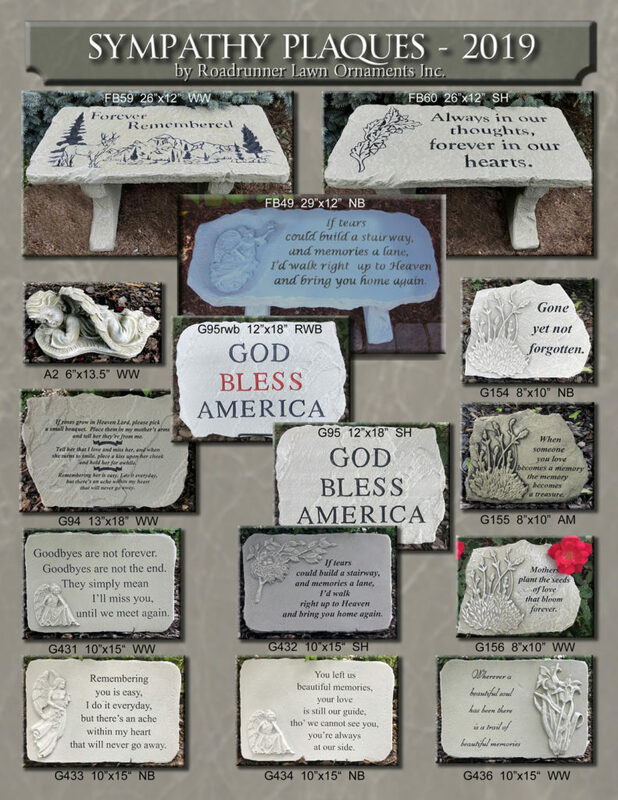 Sympathyplaques.com attempts to be as accurate as possible in our pricing, as well as our written and photographic depictions of products for sale; however, we cannot guarantee that product descriptions/specifications, pricing or any other content on Sympathyplaques.com is accurate, complete, or current. In the event that a product is listed at an incorrect price due to typographical, informational, or other error, Sympathyplaques.com shall have the right, at our sole discretion, to either honor the displayed price or refuse/cancel any orders placed for that product at the incorrect price. Your submission of an order and/or receipt of an order confirmation automated or otherwise does not signify our acceptance of such order. Sympathyplaques.com reserves the right to cancel any order that we deem necessary, at our sole discretion, regardless of the order status or whether you have received a confirmation of the order. We reserve the right to require additional information from you before accepting or processing any order. All wholesale purchases must meet the $99.00 per transaction minimum. In the event an order is placed below the required minimum we will attempt to contact the buyer so they may rectify the error. Any order not meeting the minimum and not increased to meet the minimum within two weeks will be cancelled. Sympathyplaques.com operated by Roadrunner Lawn Ornaments Inc. is an Illinois corporation and you agree that any legal action brought against Sympathyplaques.com and/or Roadrunner Lawn Ornaments Inc. shall be governed by the laws of the State of Illinois without regard to its conflict of law principles. Additionally, you agree that any and all disagreements arising from your use of or orders placed through Sympathyplaques.com will be adjudicated in Christian County Illinois by an appropriate Federal or state court. All purchases are subject to approval by sympathyplaques.com. All wholesale purchases must meet the $99.00 per transaction minimum. In the event an order is placed below the required minimum we will attempt to contact the buyer. Any order not meeting the minimum and not increased to meet the minimum within two weeks will be cancelled.